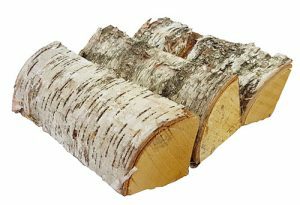 Kiln dried birch logs make excellent firewood – they catch fire quickly and warm your home faster than the other hardwood species, making them ideal if you use your stove or log burner primarily in the evenings or at the weekend. We recommend birch for beginners and casual users as it’s so easy to get your fire roaring with very little effort or skill. 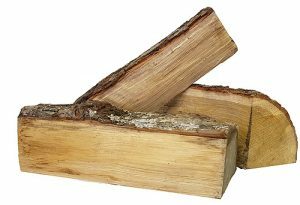 Not as dense as ash or oak, birch logs burn slightly quicker, releasing their heat faster, with very little kindling required at all. Quick tip for starting your fire with birch logs – instead of using firelighters, simply pull the bark of birch away and use it in a similar fashion to firelighters, as the oils in the bark make it an excellent firelighter and will help the logs catch fire with only a small amount of kindling required. All of our products are available in Birch – simply select the species before adding to your cart. 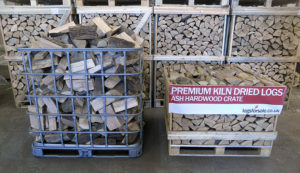 We also sell kiln dried ash and oak logs for more intensive use – please visit our homepage to learn more about the various species that we offer. To demonstrate the value in purchasing our crated firewood, we emptied the logs from one of our Small Crates in to an empty IBC cage. Traditionally in the UK firewood is sold in builders bags or “loose” loads from tipper trucks – while our small crate may look small, due to the fact it’s 4 rows deep of logs and neatly stacked it actually holds a significant amount of logs – approximately 1.28m3 of loose logs. We recommend our small crate for casual users, and one should see you through the entire winter season. If you use your stove more intensively, consider our larger Extra Large Crate.